Markal/Shiva Paint Stiks are awesome! All the way back in November I announced that I had played around with some fabric print using a type of oil paint sticks. For some reason, they go by two different names. They are called Shiva in the US and Markal in the UK and here in Sweden. They are a little bit like giant crayons, you know, like the one designed for the littlest of kids, only they are filled with permanent oil based gorgeous color. 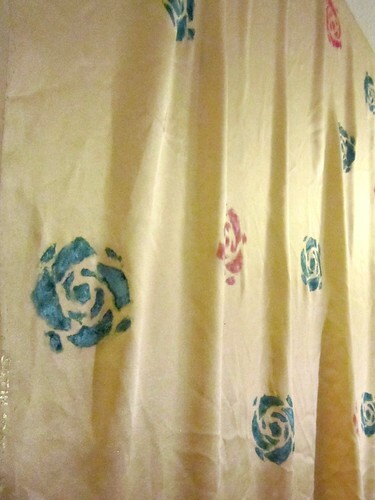 I used them with a rose stencil that I made, and tested it out on both silk and denim. Just to see how the color responded to different kinds of fabric. This is how it looks on a very dark blue denim. The colors I have chosen are iridescent, which you probably can tell from the picture. The skirt by the way, is another version of BurdaStyle Magazine 02-2011-107, my new favorite skirt pattern, seen here and here as well. It might not look the same in every monitor, but I am amazed by how the color behaves more or less the same way on the denim and the silk. It was equally easy to work with on both types of material, and the great part is, you set the color by ironing, and then you can wash it like you normally would! Fantastic. I really love the vibrant colors you get from this, and how you can use the PaintStiks in so many different ways. To get some inspiration, have a look here. I will most certainly make more use of these magical coloring devices, and try them on other types of fabric as well. I printed a little rose on the back of the skirt as well, just for the fun of it! I looks amazing on my computer. That’s a great outfit, the effect of kimono style sweater over the painted skirt is great. Love the stencils – beautiful! That looks great! I especially like the colors against the dark denim. have you tried using texture plates? They are also fun to use with the paints. So fun! I have wanted to try that out. My husband uses those on some of his paintings. I may have to swipe them! That’s a great idea! The result is amazing, what a fab outfit! This looks great and i love your cardigan! What a cute idea! Your skirt looks fantastic, and I just love your cardigan! Absolutely beautiful! Woweeeee! 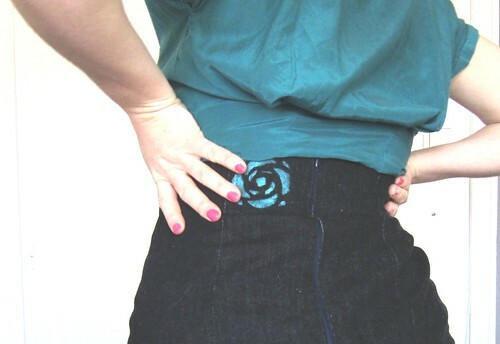 I love the effect on the denim – it looks very effective, but totally in tune with your “FUN” theme. That cardigan is causing me to drool …..I am off to check it out! Thanks! 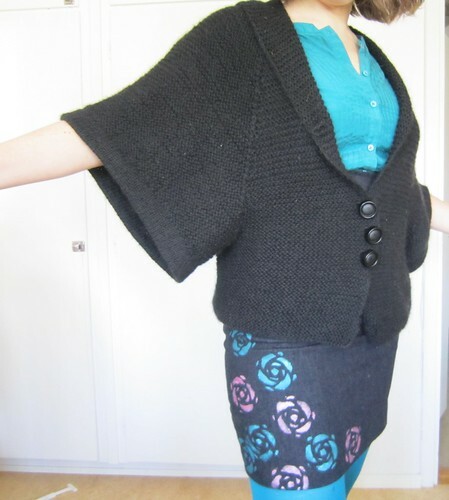 The cardigan is made up rather quickly, garter stitches and raglan sleeves – super easy!